Very complex and complicated situation in Venezuela. We hear the recall referendum is called off? The National Assembly and its opposition majority want to impeach Maduro? 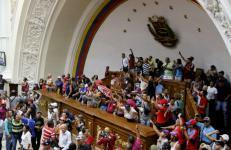 On monday Chavista rank and file stormed the National Assembly in order to prevent the right wing majority to impeach President Maduro. Huge mobilizations to overthrow Maduro and against took place during the past days. Friday a strike called by the opposition failed, not even the notoriously anti-government chamber of commerce supported the strike. What is happening in Venezuela? fraud against them is happening. Contrary to all complaints from right and left I think that the procedure to stop the referendum can be justified in line with the law and constitution. That it is legal does not mean it is politically convenient or right. I think in fact it is a political mistake to postpone or prevent the recall referendum from happening. An "impeachment", that means that the parliament induces a juridical process against the president and takes him/her out of office (as it happened in Brazil, Paraguay and Honduras) does not exist in Venezuela. Therefore all declarations by the opposition that are picked up and repeated by the international media, are total nonsense and illegal. result she wanted and the government keeps stepping into traps the opposition is setting up. Since the recall referendum signature collection started it seems likely that the opposition is not interested in having a recall referendum and taking over the government. They cannot change the Oil prices and will not want to be in a position to be blamed for the crisis and the incapacity to solve it just 2 years before presidential elections. They want to win the next presidential elections. Why did the opposition start the process of collecting the signatures so late that it was already very improbable to have it happening in 2016 (if the recall referendum happens in 2017 the time to the next elections is so short that by law - if Maduro loses - the Vice President takes over until the next regular elections)? It could have started the recollection in January and made sure the referendum can happen in 2016. The opposition needed only 1% of the electorate's signatures in the first round (some 120.000 signatures) but presented 2.5 million signatures. That delayed the time to proof the signatures innecessarily. Moreover more than a third of the signatures were false. Since the recollection is based on the elections registrations lists and is counterchecked with personal ID, 30% of false signatures cannot be a human mistake but indicate an organized and systematic fraud perpetrated by the referendum organizers. Beyond the fact that only one out of the 3 big currents of the opposition party MUD officially supported the referendum (the others did not even sign! ), most of the opposition did not support nor ever believe in the referendum. referendum overwhelmingly. Maduro will for sure not achieve the same result, but it is also not certain that he will lose even if he and the government are highly unpopular. The right orchestrated everything in order to perpetuate, similarly to Brazil, Honduras, Paraguay... a "parliamentary coup". The connection with the referendum is casual. The argument the right uses for the impeachement of Maduro is that he did neglect the country because he travelled to Saudi Arabia and Qatar. It is therefore good and understandable that the rank & file mobilized and occupied the National Assembly in order to avoid a situation that from the outside would have looked as Dilma's impeachment in Brazil. Videos and pictures form the National Assembly show that it weren't "Chavista thugs" or "armed colectivos responding to the government" that stormed the National Assembly, but simple people from the poorest neighborhoods, especially many women over 50 years of age. During the coming mobilizations many people will become active that are very critical or opposed to Maduro and his government, but definitely do not want the right to be back in power. That will obviously not solve the crisis in Venezuela, neither will the Maduro government (at least not in a socialist and participatory way). If the right fails with its ambitions to provoke a system colaps in Venezuela, the most urging question will be if the rank & file in Venezuela can now and in the future also mobilize for a change of politics of the government.